@otwcoverage Scott Martin culled up to about 12 pounds now. 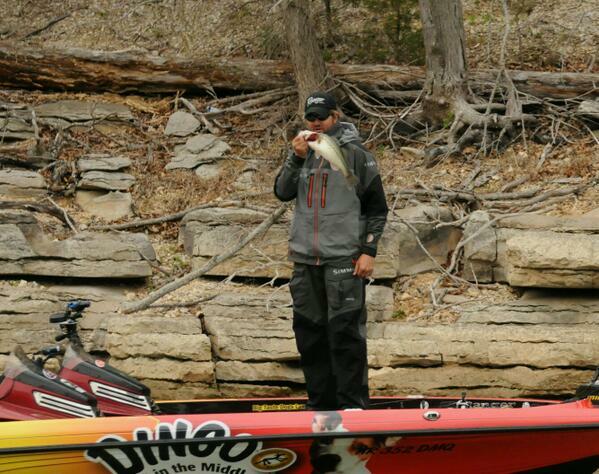 @otwcoverage Micah Frazier is fishing the mouth of Van Hollow. He has a respectable limit. @otwcoverage The lake is really white capping now. Scott Martin ran off and left us, but he's in a Ranger. @otwcoverage Morgan upgraded about 10 minutes ago. Has about 9 lbs. 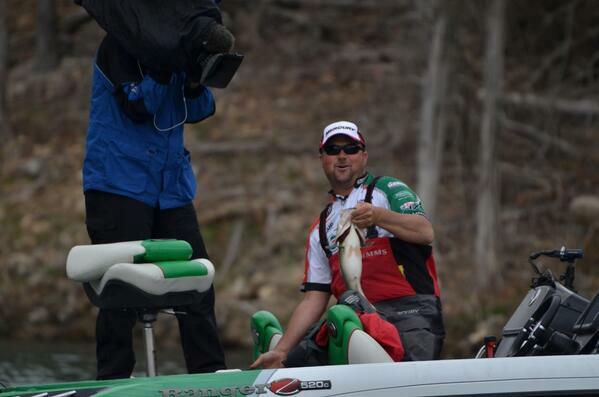 @otwcoverage Scott Martin just caught his fifth keeper, but he had to use the bump board on it. He's up to about 11 pounds. @otwcoverage A keeper just chased Morrow's crank to the boat, but it wouldn't commit. @otwcoverage Morrow is being very thorough. He said it took him all morning to fish one creek, but Andy Morgan came in and covered it in 30 minutes. @otwcoverage Scott Martin is slowly building a good stringer. He now has four for about 10 pounds. @otwcoverage Frazier battling gusts of wind picked up his fourth keeper. @otwcoverage Dudley is on fire! He just made another cull to gain about 2 pounds. @otwcoverage Uh-oh. Travis Fox has a limit pushing 15 pounds. @otwcoverage Cody Meyer just culled again, but only picked up an ounce or two. 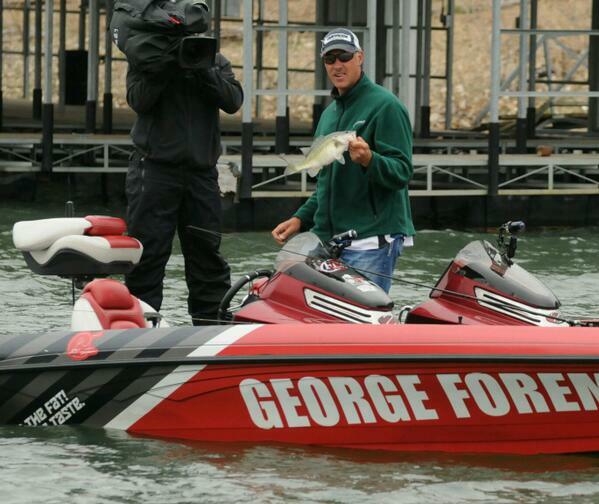 @otwcoverage Morrow said he caught a 10-inch spot on an 8-inch swim bait. It was hooked in the mouth and the tail. Talk about aggressive fish. @otwcoverage Morgan now to about 8 pounds with his limit. 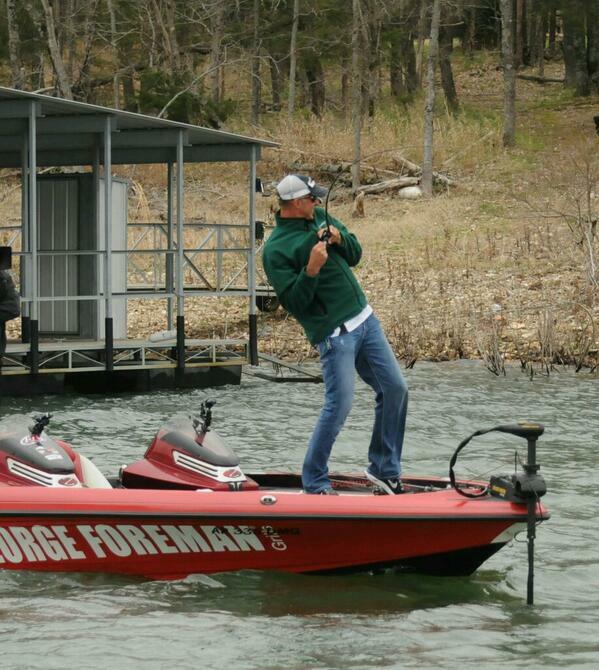 @otwcoverage Morrow's biggest issue is that Andy Morgan is running down one of his good banks with the same crankbait. @otwcoverage Morrow just lost a big spot at the boat. "It would have culled. That one hurt"
@otwcoverage Morrow has 5, all caught on a crankbait. He's had a lot of bites today. Has 2 good ones but needs a real kicker. @otwcoverage Matt Arey just landed the biggest fish of the tournament! A 30 pound flathead. 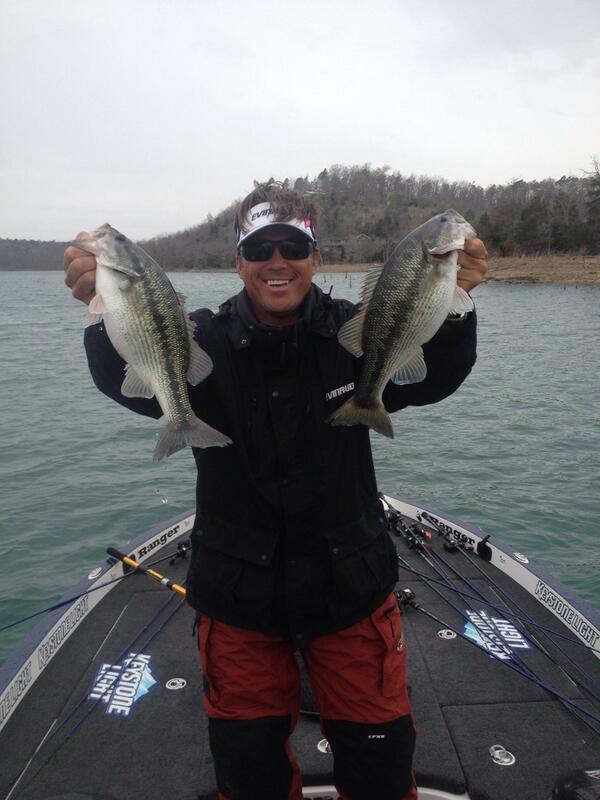 @otwcoverage Cody Meyer has five for about 8 pounds; he's culled once. He's down toward the dam. @otwcoverage Matt Arey just upgraded. Not much but the weight is climbing. @otwcoverage Cody Meyer made his move toward the dam, he has made one upgrade so far. @otwcoverage Cull time for Dudley now after adding a small spot to the livewell. @otwcoverage Frazier climbing the ladder, up to three keepers. @otwcoverage Ashley has his limit. Needs to find a few kickers now. @otwcoverage Micah Frazier has three in the boat, including a 3-pound smallmouth. @otwcoverage Scott Martin is having a tough time of it. The fish have sulled up where he was smacking 'em yesterday. He's still got only one keeper. @otwcoverage Dudley is complaining that there is a lack of 20-30 mph winds that were forecasted for today. Only an angler would complain about that. @otwcoverage That's a five bass limit, as Chris Jones would say! Arey is stoked. His 5th bass brought him up to about 13 pounds! Looking for kickers. @otwcoverage The wind is really starting to pick up and the skies are beginning to open. Looks like a fun afternoon ahead! @otwcoverage Casey Ashley moved about 3 miles away from the dam; he just boxed number four. @otwcoverage Sorry, Fox not fix has a limit. He's pretty jacked up right now. @otwcoverage Fix has a limit. We underestimated his big one. He says it's at least a 5. @otwcoverage This thing could be almost over. Arey just caught a 4-pounder. Can anyone catch him? @otwcoverage Troy Morrow has a limit, one pretty nice one. @otwcoverage "Every day I've had to make adjustments--presentation, lures, whatever--so today's no different," says Scott Martin. He still has only one. @otwcoverage Fox just caught his fourth. It's about 1 3/4 pounds. @otwcoverage Morgan now with three for about 4.5 pounds. @otwcoverage Dudley adds keeper No. 4 of the smallmouth variety. He has close to maybe 7 pounds. @otwcoverage Mark Rose has a small limit and is making a move from Prairie Creek to the river. @otwcoverage It's starting to sprinkle down south. @otwcoverage Keeper number three for Fox. Not a big one but it's a keeper. @otwcoverage Your tournament leader is getting hot! Matt just boxed another 2.5 largemouth. Close to 7 pounds. @otwcoverage A short fish for Fox. He spent a lot of time dissecting his last spot. Off Limits: See Rule #13 plus the entire no wake area at Prairie Creek Marina including the beach area (see map at www.flwoutdoors.com). There is no fishing within 50 feet of any commercial marinas. All competition waters are off-limits March 24 - April 5, 2014 and April 9, 2014. Fishing License: An Arkansas license is required and may be purchased by calling 501.223.6349 or online at www.agfc.com. Service Trailers will locate at Rogers Outdoor Sports on April 7, 2014. The top 10 tour boats will be at Rogers Outdoor Sports, 2115 West Walnut Street, Rogers, AR.